The Marlborough region property pulse factsheet for July 2012 is published using data from Realestate.co.nz and REINZ (Real Estate Institute of NZ). Property sales across the Marlborough region at 82 in the month was up strongly on a seasonally adjusted basis in July and was up a very significant 32% as compared to a year ago. The inventory of unsold houses on the market fell to 52 weeks of equivalent sales. The current level of inventory sits just under the long-term average of 55 weeks indicating a trend to a sellers market. Median sales price for properties sold in the Marlborough region at $266,000 was down 8% as compared to a year ago and down on the prior month. The asking price expectation of new listings was also down 9% as compared to a year ago at $361,910. The level of new listings coming onto the market in July at 153 fell from the June level of 163 but was up strongly by 52% as compared to a year ago. This data indicates that the Marlborough region is moving towards a market that favours sellers given the level of sales activity and low inventory; however the strong rise in listings matched to falls in sales and asking price favours buyers, thereby indicating that the market is well balanced. 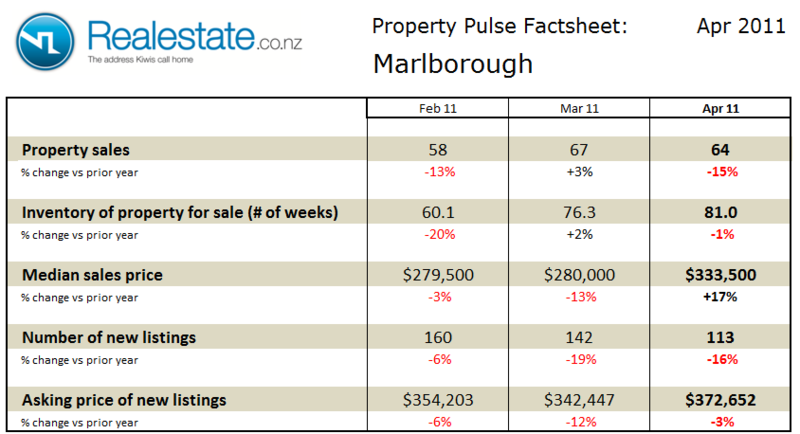 The Marlborough region property pulse factsheet for June 2012 is published using data from Realestate.co.nz and REINZ (Real Estate Institute of NZ). 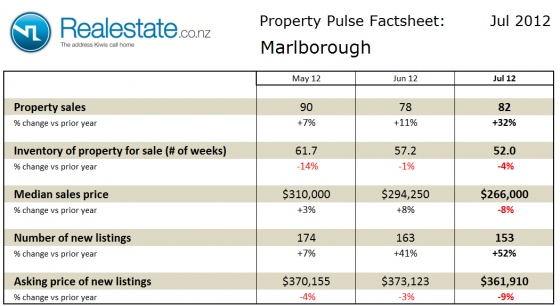 Property sales across the Marlborough region at 78 in the month was up strongly on a seasonally adjusted basis in June and was up 11% as compared to a year ago. The inventory of unsold houses on the market fell to 57 weeks, reversing a strong rise in May. The current level sits just inline with the long-term average of 55 weeks of equivalent sales. Median sales price for properties sold in the Marlborough region at $294,250 was up 8% as compared to a year ago although down slightly on the prior month. The asking price expectation of new listings was also down 3% as compared to a year ago at $373,123. The level of new listings coming onto the market in June at 163 fell from the May level of 174 but was up strongly by 41% as compared to a year ago. 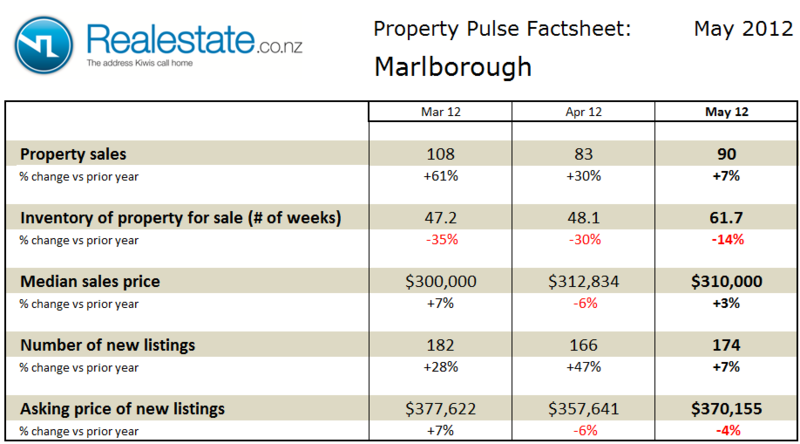 The Marlborough region property pulse factsheet for May 2012 is published using data from Realestate.co.nz and REINZ (Real Estate Institute of NZ). 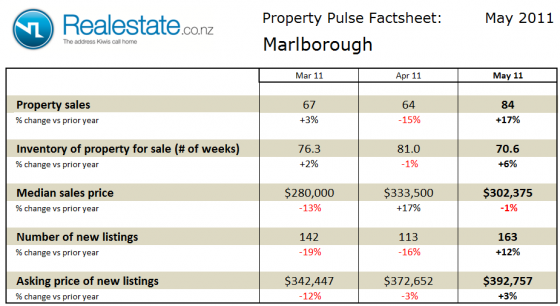 Property sales across the Marlborough region at 90 in the month fell very slightly on a seasonally adjusted basis in May but were up 7% as compared to a year ago. The inventory of unsold houses on the market rose sharply to 62 weeks to rise above the long-term average of 55 weeks of equivalent sales. Median sales price for properties sold in the Marlborough region at $310,000 was up 3% as compared to a year ago and down slightly on the prior month. The asking price expectation of new listings was also down 4% as compared to a year ago at $370,155. The level of new listings coming onto the market in May at 174 rose as compared to the prior month and was up 7% as compared to a year ago. 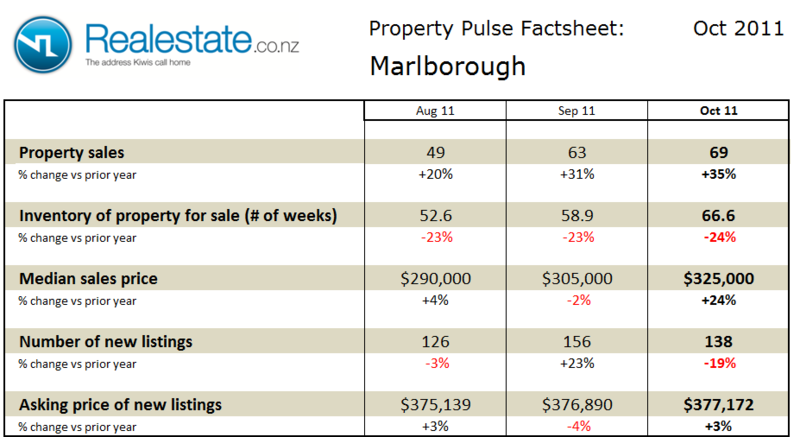 The Marlborough region property pulse factsheet for November 2011 is published using data from Realestate.co.nz and REINZ (Real Estate Institute of NZ). Property sales across the Marlborough region at 70 in the month fell very slightly on a seasonally adjusted basis in November and was down 9% as compared to a year ago. The inventory of unsold houses on the market fell back to 61 weeks to remain above the long-term average of 52 weeks of equivalent sales. Median sales price for properties sold in the Marlborough region at $275,000 was down 8% as compared to a year ago and also down on recent months. The asking price expectation of new listings was also down 4% as compared to a year ago at $364,848. The level of new listings coming onto the market in November at 193 rose significantly as compared to the prior month and was up 8% as compared to a year ago. 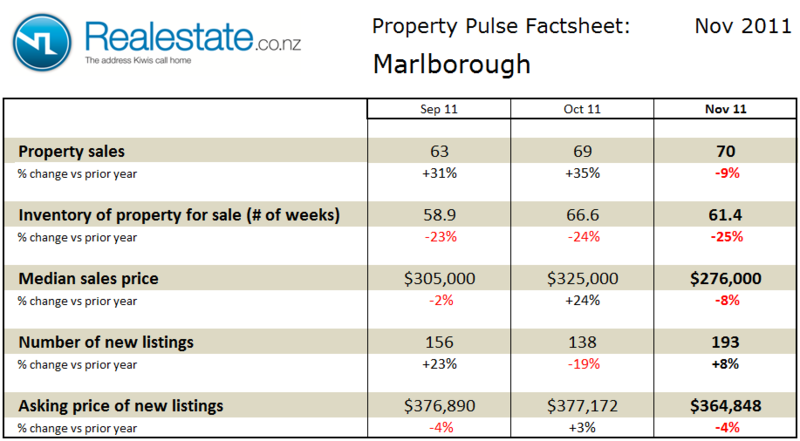 The Marlborough region property pulse factsheet for October 2011 is published using data from Realestate.co.nz and REINZ (Real Estate Institute of NZ). Property sales across the Marlborough region at 69 in the month rose very slightly on a seasonally adjusted basis in October and was up a significant 35% as compared to a year ago. The inventory of unsold houses on the market rose again to 67 weeks to remain above the long-term average of 52 weeks of equivalent sales. Median sales price for properties sold in the Marlborough region at $325,000 was up a very significant 24% as compared to a year ago and up significantly on the prior month. The asking price expectation of new listings was also up 3% as compared to a year ago at $377,172. The level of new listings coming onto the market in October at 138 fell as compared to the prior month and was down 19% as compared to a year ago. 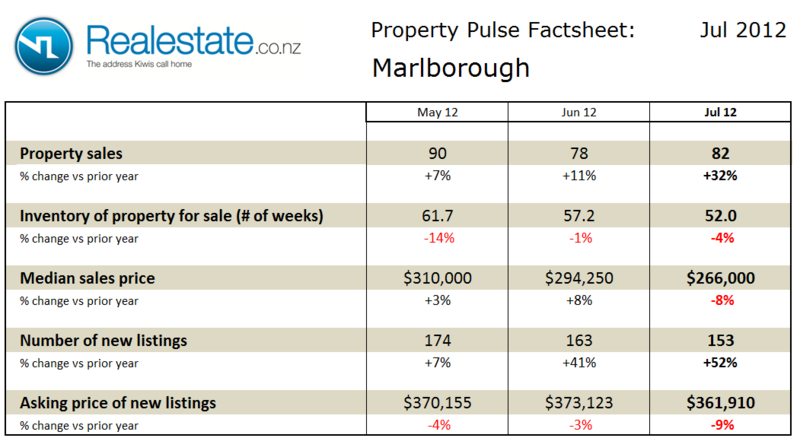 The Marlborough region property pulse factsheet for May 2011 is published using data from Realestate.co.nz and REINZ (Real Estate Institute of NZ). Property sales across the Marlborough region at 84 in the month rose on a seasonally adjusted basis in May and were up 17% as compared to a year ago. The inventory of unsold houses on the market fell to 71 weeks to remain well above the long-term average of 53 weeks of equivalent sales. Median sales price for properties sold in the Marlborough region at $302,375 was down just 1% as compared to a year ago and down significantly on the prior month. The asking price expectation of new listings was up 3% as compared to a year ago at $392,757. The level of new listings coming onto the market in May at 163 rose significantly as compared to the prior month and was up 12% as compared to a year ago. 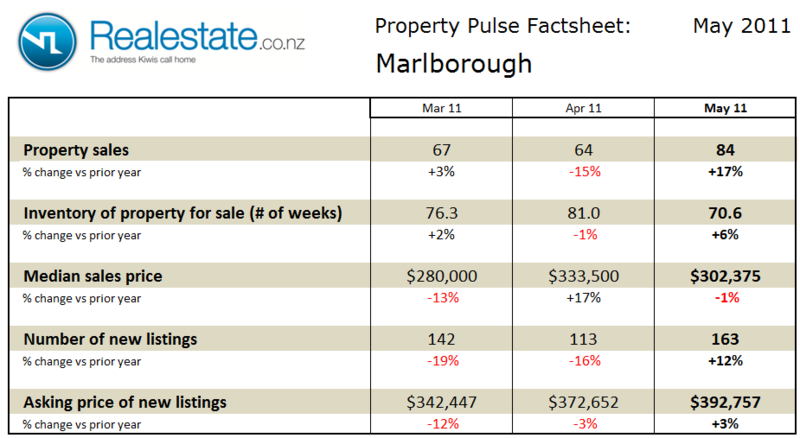 The Marlborough region property pulse factsheet for April 2011 is published using data from Realestate.co.nz and REINZ (Real Estate Institute of NZ). 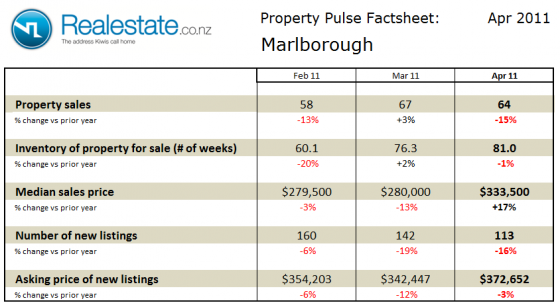 Property sales across the Marlborough region at 64 in the month rose on a seasonally adjusted basis in April but were down 15% as compared to a year ago. The inventory of unsold houses on the market rose sharply to 81 weeks to remain well above the long-term average of 52 weeks of equivalent sales. Median sales price for properties sold in the Marlborough region at $333,500 was up 17% as compared to a year ago and up significantly on the prior month. The asking price expectation of new listings was also down 3% as compared to a year ago at $372,652. The level of new listings coming onto the market in April at 1413 fell as compared to the prior month and was down 16% as compared to a year ago. The Marlborough region Property Market factsheet for October can be downloaded by clicking this icon. Property sales in the Marlborough region rose by a seasonally adjusted 6.1% in September. Over the first 9 months of 2010 a total of 480 properties have been sold as compared to 698 over the same period in 2009. The level of inventory of houses on the market in September rose to 76 weeks of equivalent weeks of sales. This level of inventory is significantly higher than the long term average of 46 weeks. This would indicate that the market is favouring buyers. Property prices for the Marlborough region are included in the broad Nelson / Marlborough regional median property price, in September this price was $330,000 down by 2.1% on the median price in September 2009. 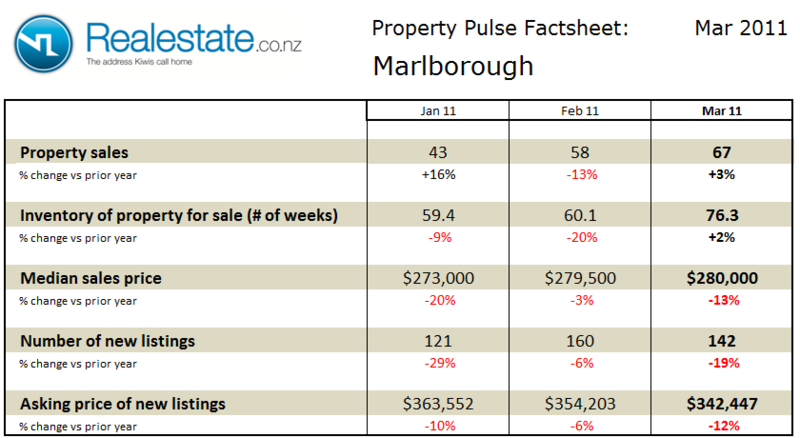 The Marlborough district Property Market factsheet for August 2010 can be downloaded by clicking this icon. Property sales in the Marlborough region fell by 33% on a seasonally adjusted basis with just 46 sales in July. On an moving annual basis sales are down 21.2% with 738 properties sold in the past 12 months compared to 936 sold in the prior 12 months. The level of inventory of houses on the market in July fell to 59 weeks of equivalent weeks of sales. This level of inventory is significantly higher than the long term average of 46 weeks. This would indicate that the market is favouring buyers. Property prices for the Marlborough region are included in the broad Nelson / Marlborough regional median property price, in June this price was $327,000 down just 0.3% on the median price in July 2009.